Driving directions to our lock box will be emailed to you 3 days prior to your arrival. Our lock box is accessible 24/7 and is lighted for your safety. In our lock box, you will find a packet with your key/access code to the cabin, driving directions to the cabin and the rental "Dos and Dont's". 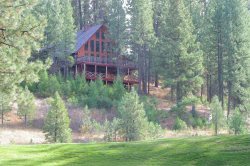 If you have several parties traveling to the cabin separately, please contact us at 208-462-3475 to arrange for directions to the property to be emailed so that you can share with your group.